Feldkirch is located at one of Austria’s main railway lines. So, it’s easy to get there by train, e.g. from Innsbruck, Salzburg (city), Linz, Vienna, or, Klagenfurt. The train ride e.g. from Innsbruck, Salzburg or Vienna will take about respectively 2, 3 3/4 or 6 1/4 hours. For details and timetables, please, check: http://fahrplan.oebb.at/bin/query.exe/en? From the west take the autoroute A12/E60, then S16/E60, finally A14/E60; from Bregenz take the autoroute A14/E60. Leave in both cases at junction 41-Feldkirch in direction Feldkirch/Frastanz and follow the signs B190/Feldkirch to Feldkirch. Turn left at Hirschgraben/B191. Hirschgraben leads directly to Schillerstraße. How to find the festival place? If coming by train, walk from the train station in south west direction. Pass straight through the historic city centre, cross the river (Ill) and you are there. (Or, have a look to the convention site’s map.) The walk will take you about 15 minutes. At the festival site there will be camping and caravan areas. If coming by car, please, check-in at the Foyer (Schillerstraße 11a) first. A parking space will be assigned to you. You may arrive already on Thursday. Breakfast (Friday–Sunday) and dinner (Friday, Saturday) will be prepared by the vegan cooking community KochKollektiv and are included in the convention fee (2 day pass and 3 day pass). Close to the convention site you'll find an organic food store and – on Saturday morning – a farmers’ market. 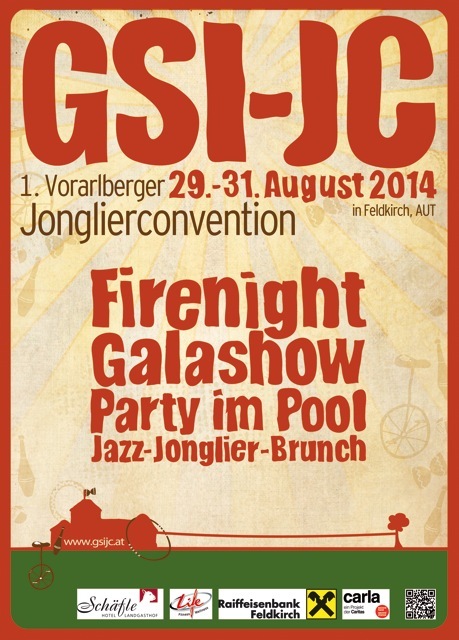 Free juggling, workshops; Friday: opening ceremony, fire night and live percussion; Saturday: gala show, party, concert: Ski-Schuh-Tennis Orchestra & DJ, Su: jazz and juggling brunch, olympic juggling games. For more details, please, visit the convention homepage, Info & FAQ. Young people (from 7 up to the age of 15) pay 50% of the fee. Free admission for children up to the age of 6. For more details see the convention homepage, Anmeldung & Beitrag. See convention homepage, Anmeldung & Beitrag. Deadline: August 10th, 2014.